Recorded in a number of spellings including Cour, Court, Cort, Corte, de Court, Decourt, Decort, Delacour, Delacourt, and others, this is a surname of medieval French origins. First introduced into the British Isles after the famous Norman Conquest of 1066 it was residential for a person who lived at a "court". This was a term used for a manor house or equivalent as well as a Royal Court. It was also occupational for somebody employed at a court. In some cases the name could also originate from the ancient word "curt" meaning small, and hence a nickname for either a small person or more likely given the robust humour of those times - a large one! Examples of recordings from surviving charters and registers include Richard atte Curt and William de la Cour who both appear in the Subsidy Tax rolls of Sussex in the year 1296, whilst Alexander Court married Elizabeth Ashpoole on August 14th 1592 at St. Margaret's Westminster, in the city of London. 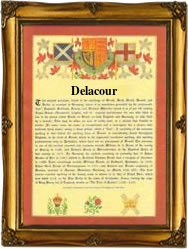 The first recorded spelling of the family name is shown to be that of Reginald de Corte. This was dated 1181, in the Pipe Rolls of the county of Suffolk, during the reign of King Henry 11nd, known as "The church builder", 1154 - 1189. Surnames became necessary when governments introduced personal taxation. In England this was sometimes known as Poll Tax. Throughout the centuries, surnames in every country have continued to "develop" often leading to astonishing variants of the original spelling.